Buying a designer handbag is undoubtedly one of those major fashion milestones in a girl's life. But before your big splurge, it's always best to make sure you've done your homework. Unfortunately, knockoff bags are all too common, so knowing what to look for can make all the difference when you're buying secondhand or from somewhere that's a little off the beaten path. To help make things crystal clear, we tapped the experts at Vestiaire Collective, a luxury retail site that has nailed the science of spotting fakes. 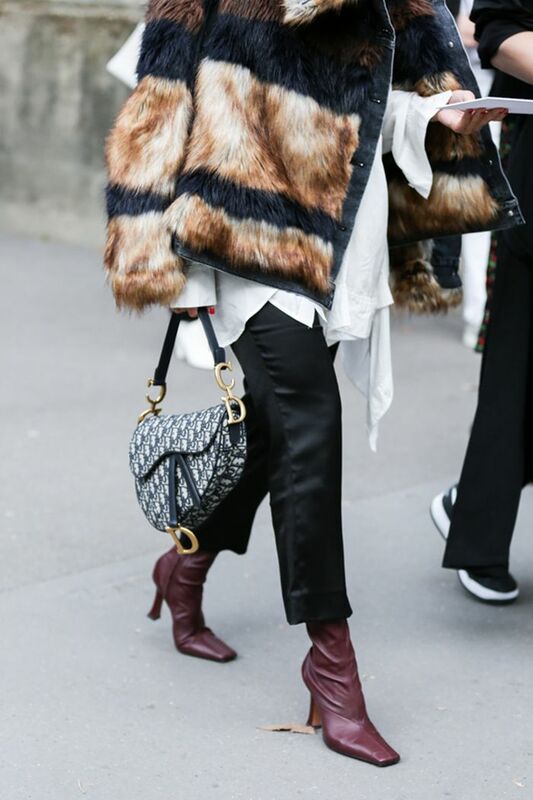 Victoire Boyer Chammard, Vestiaire Collective's Head of Authentication, offered some tips and expert advice for when you're on the hunt for your designer bag. Starting with "do your research," he says. "Arm yourself with the knowledge of what your designer bag should look like, and go from there." Armed with her advice, you'll be ready to treat yourself to your dream bag, totally stress-free. Read on for Boyer Chammard's seven signs of a fake handbag, and then shop current designer styles that we love. "Designers spend a lot of time perfecting the typography of their labels and logos," he tells us. "These should always be crisp and defined. Metallic stamped logos should never scratch off with your nail. They are stamped to last. You'll rarely see blurry, flaky, or bubbly stamping. Engraved logos will always be clean and fully defined. Keep an eye out for engravings that are not fully defined, sloppy, and with letters that overlap or run too close together." "Designers often release updated versions of popular styles with small variations or improvements," she notes. "But for the most part, the measurements will remain the same from one bag of the same style and size to another. Keep in mind that retailers may measure dimensions differently from others, so there may be a variance of .5 inches. Take heed if the measurements differ more than 1.5 inches or the proportions look very off." "What comes with the bag is just as important as the bag itself," he continues. "Dustbags, boxes, straps, care cards, locks, and keys compliment your bag and maintain the same quality standards. Look out for any accessories that are super lightweight or falling apart. Care cards should have proper grammar (so make sure to read them through—no SparkNotes for this one). Printing should be crisp and centered, and hardware should be weighty with engravings that are well defined." 4. Does the model even exist? "The model must be an official design of the brand, within the appropriate time period. If you are unsure of the model, you must find the DNA of the product: specific print, material, hardware colour, etc," he says, adding you should "be vigilant of the shape. Proportions should be harmonious." "Top luxury brands always construct their products with the best skins, fabrics, and metals/hardware," says Boyer Chammard, adding some key examples for your references. Like the fact that Hermès has exceptional materials and variety in skins or that the closures of Chanel vintage bags are plated in authentic gold. In addition, Gucci, Goyard, and Louis Vuitton are made with durable, high quality coated canvas. He continues: "Pay close attention to the weight of the materials, for example, luxury brand hardware is typically moderately heavy." Just like typography, engravings can be a dead giveaway for a fake bag when they're wrong. "Typography should be proportionally sound and centred to the metal surface. The surface should respond to light evenly with every movement." So now you know. "Be sure that a serial number is present. On vintage items, a serial number may be worn down or not present at all. Beware that counterfeit items can have a duplicate serial number." The leather strap gives this classic bag a slightly more unusual look. A mini bag can be plenty of fun. Trust us, The C Bag is going to be a big deal in 2019. Just the right size for a day out and about. This post originally appeared on Who What Wear U.S. at an earlier time and has since been updated.